Posted by John Ruby in BlogoSphere, Microsoft, Paul Thurrott, Software, Windows 8. If you’re familiar with Windows Phone, you know that this system presents a dual view user experience, with a primary screen called the Start screen that is filled with pinned tiles and a secondary screen called All Apps that lists every single app installed on the device. In the Windows 8 Developer Preview, however, only the Start screen was readily available. To get to All Apps, curiously, you needed to instantiate a search. Guess what just got a lot easier? In the Windows 8 Consumer Preview, Microsoft has fixed All Apps, making it much easier to access and, as important, making it even more useful than the similar feature in Windows Phone. The new All Apps interface, shown below, includes a few improvements, too. First, as you install new applications, the All Apps screen will segregate each of the app’s various executables into groups so that they’re together. As you can see above, there are groups for internal items (Windows Accessories) as well as applications that were installe separately by the user (Microsoft Office). Also, the presentation is denser than it was in the Developer Preview, providing more apps onscreen at once. Microsoft tells me, however, that one more change is coming. What’s missing, currently, is a way to easily get back to where you just were. So between the Consumer Preview an RTM, Microsoft will add an App Bar to the interface with a button to go back. Note that you can still search for apps as before, and that’s true whether you’re in the Start screen or the All Apps view. To start a search, simply start typing any letter. Get the tools to build Metro style apps for Windows 8. Our free download includes Microsoft Visual Studio 11 Express Beta for Windows 8 and Blend for Visual Studio 11 Beta to help jumpstart your project. Experience the newest version of Windows and see for yourself how apps are at the center of the Windows 8 experience. Our docs are optimized to make you more productive. Discover everything you need to plan, build, and sell great apps. 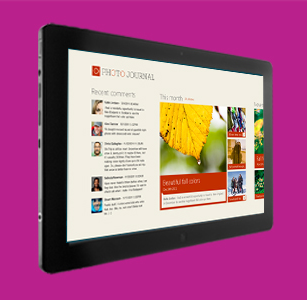 Windows 8 Consumer Preview introduces many powerful features for developers. Discover the new features for Desktop, Web, and Metro style app developers.